First, there was the Taiwanese snowflake dessert. Then came the bubble tea movement. Soon after, hipster burger joints sprouted all over the country. These days, everyone is talking about – and eating – poke bowls. Aaron Lim of The Fish Bowl may well be the person to thank for sparking this obsession. 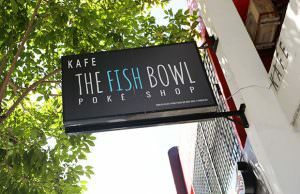 The Fish Bowl opened in August last year in Sunway, making it arguably the first poke bowl restaurant in the country. The former baker and culinary graduate, Lim was moved to open a poke bowl eatery after witnessing its popularity in Singapore last year. But things didn’t quite get off on a smooth note for him. “When we first opened, people would walk in, had a look around and walked out. They thought it was a salad bar and had no idea what a poke bowl was,” he shares. Slowly but surely, it found an audience, and at last count, there were almost a dozen poke bowl restaurants in the Klang Valley. 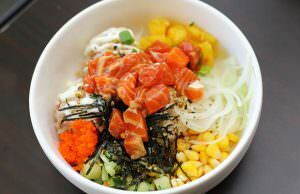 Folks in major cities like New York and Los Angeles are also beginning to show a strong interest in poke bowls. So what exactly is a poke – pronounced as pok-kay – bowl? Although it shares similarities with the Japanese chirashidon in that it is a rice bowl topped with fresh slices of fish, it is actually a Hawaiian staple. Fresh seafood is available abun­dantly in Hawaii and is found everywhere, from restaurants to grocery stores. A poke bowl is eaten as an appetiser or a main meal, depending on the time of day and the occasion. In Hawaii, popular types include the shoyu ahi poke (yellowfin tuna marinated with soy sauce) and aku tuna, which is an oily tuna fish. The seafood also does not necessarily need to be raw, as it can also include cooked shrimp and octopus. In Malaysia, salmon is a popular choice. Lim, however, had to do more tweaking to cater to local tastebuds. “The traditional poke bowl, which is basically rice, fish, minimal seasonings and small portions of vegetables, does not appeal to the locals as it seems rather bland.” This is why kaffir lime and sriracha hot sauce have been added to the repertoire. For those in a hurry, The Fish Bowl has four pre-prepared bowls including the shoyu salmon bowl with pineapples, corn, furikake and ebiko, and seasoned with garlic sauce. But the fun is in customising your own bowl. The choice of the base includes white rice, brown rice, baby greens, quinoa or pesto rice. There is a variety of seasonings, among them lime aioli, herby lime and sesame miso. As for the protein, there are salmon, tuna, shrimp and chicken, while tofu is available for non-meat eaters. Lim points out that the salmon is imported from Norway because it is the best. Premium options include soft shell crab and teriyaki unagi. Lim is confident that poke bowls will survive beyond the trend. After all, The Fish Bowl opened two more outlets this year – in 1 Utama Shopping Centre and Pavilion Kuala Lumpur. It also has plans to open in Kiara 163, a new upscale mixed development in Mont Kiara, as well as Berjaya Times Square. 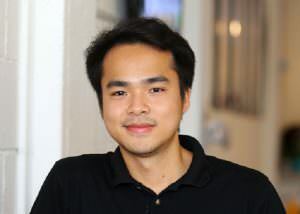 “Malaysians do follow trends but without these trends, we won’t be able to learn about new things. For example, after the coffee wave arrived here in Malaysia, we learnt more about coffee beyond the mainstream coffee chains. I believe that it is a good time for people here to know about poke bowls and discover different ways to eat healthy besides your usual greens and juices,” he says.